A winning streak has to start somewhere for the University of Hawai’i basketball team. Why not Santa Barbara, Calif. The Warriors’ California road trip hit its fourth destination on Friday in Santa Barbara. Hawai’i will play at UC Santa Barbara in a Big West Conference game on Saturday at The Thunderdome. It is scheduled to start at 5 p.m. (Hawai’i time) and will be televised on ESPNU. Hawai’i is 16-8 overall and in fouth place in the Big West at 4-4; UCSB is 10-11 overall and in fifth place at 3-4. Through the first half of the Big West regular season, the Warriors have been the ultimate .500 team – win one, lose one, win one, lose one, etc. 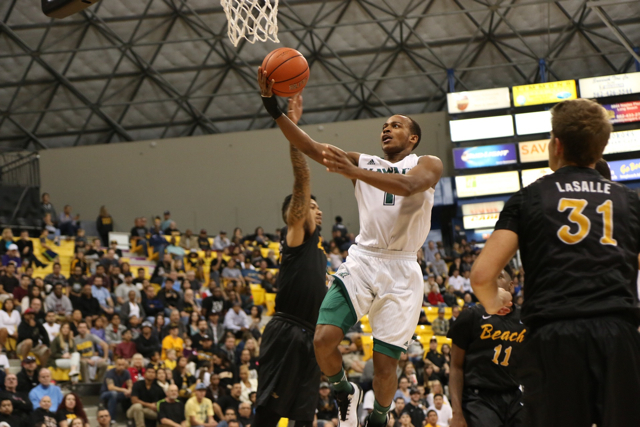 The Warriors are coming off perhaps their best defensive game of the season in a 59-56 win at Cal Poly. They will need a similar effort against a UCSB team that is 7-2 at home this season and also relies on its defense. If anything, the Gauchos are well-rested. They last played on Jan. 31, though it resulted in a 77-55 loss at UC Irvine. UCSB has played the last four game without its star player, Alan Williams, who has a shoulder injury. The senior center is averaging 17.1 points and a conference-best 11.6 rebounds per game, and was last season’s Big West Player of the Year. Despite the extra week of rest, Williams is not expected to be ready to play against the Warriors. The Gauchos are still a dangerous team without him. Michael Bryson, a 6-foot-4 junior guard, is averaging 13.0 points and 4.5 rebounds per game, and ranks second in the conference with a .904 free throw percentage. John Green, a 6-5 junior wing, is averaging 11.0 points and 4.5 rebounds per game; Gabe Vincent, a 6-3 freshman guard, is contributing 10.0 points per game and leads the team with 2.1 3-pointers per game; Zalmico Harmon, a 6-foot senior point guard, is averaging 6.4 points and 4.1 assists per game. UCSB leads the Big West with 15.4 assists per game, but perhaps its most impressive statistic is on defense. The Gauchos are the only Big West team limiting opponents to below .400 field goal percentage at .398. Hawai’i is limiting opponents to a .412 field goal percentage, and just held Cal Poly to a .283 percentage on Thursday. The Warriors lead the Big West in steals at 10.3 per game, and are forcing opponents into 17.5 turnovers per game. The Warriors continue to get balanced numbers from their primary rotation of nine players. Sophomore wing Aaron Valdes leads the way with 14.6 points and 5.6 rebounds per game, followed by senior guard Garrett Nevels at 10.5 points and 4.6 rebounds per game. Junior point guard Roderick Bobbitt is averaging 8.6 points per game and leads the Big West in assists (5.9) and steals (3.2). Sophomore forward Mike Thomas scored a career-high 18 points at Cal Poly, and now leads the team with a .497 field goal percentage in addition to his 8.5 points and 4.0 rebounds per game. Radio: Live on ESPN 1420 AM. Neighbor islands can listen live on KNUI on Maui, KHLO in Hilo, KKON in Kona and KTOH on Kaua’i. The University of Hawai’i men’s basketball program is hosting an alumni game on Saturday, February 14, at the Stan Sheriff Center. The game will start at 4:30 p.m., and will be followed later that evening at 7 p.m. by the Hawai’i vs. Cal State Fullerton game at 7 p.m. Notable attendees include Eric Ambrozich, Jason “JC” Carter, Saint Anthony Clements, Dennis Chai, Al Davis, Kawika Hallums, Ryne Holliday, Phil Martin, Kalia McGee, Woodrow Moore, Miah Ostrowski, John Penebacker, Geremy Robinson, Tim Shepherd, Kelii Silva, Justice Sueing, Johnny White, and Artie Wilson. 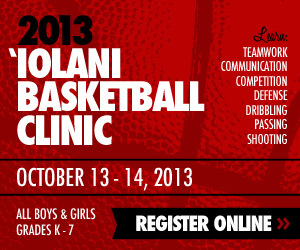 Participants will be honored at halftime of UH’s game against Cal State-Fullerton. Fans with tickets to the Cal State Fullerton game will be allowed to enter early to watch the alumni game. Tickets can be purchased at the Stan Sheriff Center, and each ticket will be good for entry to both the alumi game and the Cal State Fullerton game. THREE STAR PLAYERS. It has occurred to me that we haven’t had as many 3 star players on our team as we do now. Perhaps that is a good reason why we have done so well. To separate yourself from the rest of the Big West we need to continue the trend but checking our recruiting info there are none in sight. In fact it doesn’t look like there is much interest in UH or we aren’t making offers. Part of that is the NCAA investigation but would be nice to know what’s going on. Any of you tuned in guys have info you’re holding back? THE ABSENSE OF ISAAC FOTU: Can anyone tell us how Isaac is Basketball career is doing in Spain? Love the guy and wish him the best and I don’t think any of us want to forget about him. At the same time, his leaving has had a monster impact on our team just as much as if he had stayed. It has caused everyone else to step up in a way that wouldn’t have happen with him as the centerpiece of our team. It has allowed us to grow faster and put us in a better position for next year as well. What we do miss without him is the needed “go to” guy that we can count on every game. We get great performances from many of our player’s one game and then there is a drop off. With so many players improving from last to this year, I hope one or two can step up to the next level. 1. Hawaii built a nice 12-0 lead over Long Beach, based on steals, transition baskets, and long-range three point shots by Valdes and Jankovic. 2. NONE of the first 12 points were from interior baskets, dunks, or free throws. 3. Hawaii continued to shoot 3 point shots, but almost all of them missed, leading to transition points for Long Beach, who slowly started creeping up. 4. A turning point came at around 14:00 left in the first half, when Jankovic tried to drive to the basket and was called for a charge, after bowling over a few of the smaller Long Beach guards. This would be the first of 6 MORE charging calls Hawaii would be penalized for as the game went along. 5. Those 7 or so charging calls were BACK BREAKERS against Long Beach and set the tone for the referees calling more fouls against Hawaii. 7. Hawaii rarely used the Mike Thomas / Stefan Jovanovic combination against Long Beach…. which might have worked for higher percentage shots… Long Beach is NOT physically imposing defensively inside… and if we posted up BOTH Thomas and Jovanovic, we could have STOPPED Long Beach’s momentum. 8. Against Cal Poly, the Thomas / Jovanovic combination WORKED… and we physically beat up Cal Poly… even Benjy Taylor said so on the radio yesterday, and in the Star Advertiser this morning. Santa Barbara… without Alan Wiliams… will be vulnerable inside… I’m anxious to see Mike Thomas and Stefan Jovanovic get more minutes together. 10. If Hawaii wins tonight, we have a good chance to be 19-8 (7-4) on Feb. 12, when we pay Irvine a visit… I am circling that date on my calendar… Irvine was able to solve Hawaii’s press and make us pay with open 3 point shots… If don’t press Irvine, I think we’ll catch them off guard… hopefully. njacinto….. appears, to me, UH scores well in the paint, not a lot of threes, some… and Guard the paint… from layups to bigs trying to score.. and jump out at , with hands up, three ball shooters.. crazy Poly, near all their points where on Threes or FT’s.. weird, However UH beat them. That is probably the formula, for Grind Out Wins, and to have chance for BWC tourney title, grind, in half court O and D.. and execute to win..past Riley Teams, that is what they did too, D and toughness, with good PG’s who closed out games, When UH had the winning seasons, NIT or NCAA..
Whatever works.. I like that MT, Stef Jovanovich, Valdes, Nevels and Bobbitt starting 5, with Janks, NWC, Fleming and Smith off the bench.. if guards in foul trouble, hope not.. Niko can spell one of the first 4..
Would be great to get this 17th win, Just all out effort.. cannot just beat them up and down, and jacking threes.. Tough D, Rebounding, and scoring inside, layups, dunks, hookshots, loved the bank shot by MT..
Tough game, Go Warriors Go Bows!! On a side note K. Collinsworth from BYU who had a triple double against us broke the record today with his 5th triple double of the season. I know it doesn’t actually relate to our team, but that greatness is something our team should strive toward. I dont know if he would have gotten the triple double against us if we were at 100% but that does not diminish the fact that he did get it. WOW!!! Irvine just beat Long Beach 56-55 with a last second shot… at Long Beach. UC Davis is alone at the top of the Big West at 7-1. Who beat Davis????? Us….